Apples are one of my favorite go-to healthy snack for any age! 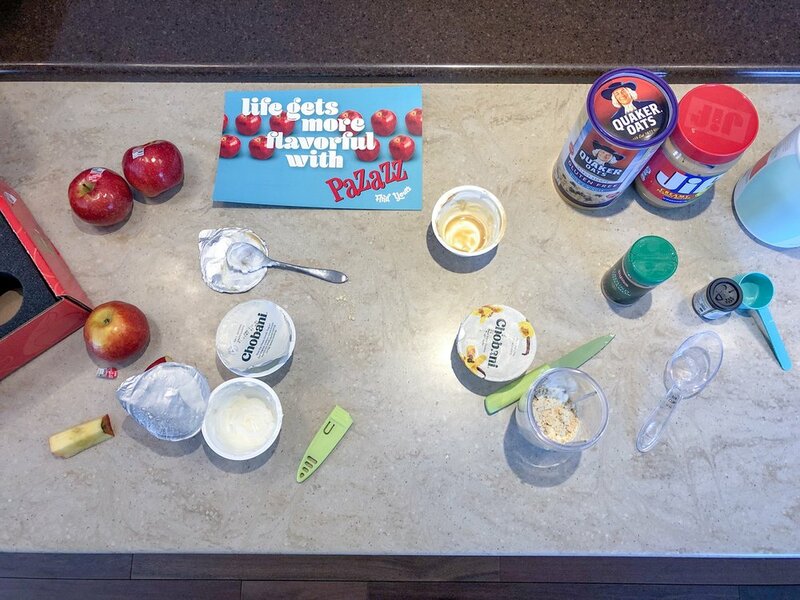 I am excited to partner up with Pazazz Apples to create new healthy recipes and help you incorporate more fruit into your diet. How does one even go about choosing the “perfect” apple? Next time you are at the grocery store, make sure you pick up these Pazazz apples as they are the perfect blend of sweet and tart for almost every apple lover. They are a descendant of the Honeycrisp but they harbor their own unique flavor and offer a crunch with every bite! You can visit their website HERE to find out more and the locations on where they are available for purchase. Add in ice, blend until smooth. **This is a thicker smoothie so if you like it less thick, use water or any milk to thin it out. 🍎🍎Remember if you want to sweeten up any of these recipes you can use Stevia or any other low calorie sweetener. Also if you are looking for more protein or none at all, you can take it out of the recipe or add it in to any of these recipes that I have created. **This is a sponsored post. All words and thoughts are my own. All recipes are original and developed by me. Soooo as I was craving pasta and stuffing my face with a leftover donut as I was looking for something to make for dinner. I came across one of my favorite recipes, Baked Cream Cheese Spaghetti. Then I thought I should probably avoid the pasta and maybe find a substitute to keep it “Keto” friendly. A small miracle that I actually had fresh mushrooms on hand and also cauliflower. So that’s how a new recipe was born! 12oz spaghetti - I substituted for 1 head of cauliflower. I cut it larger so it didn’t get mushy. 1/2 cup parmesan cheese, grated- I just used Colby jack shredded cheese because I didn’t have parmesan. 1.) Preheat oven to 350 degrees. 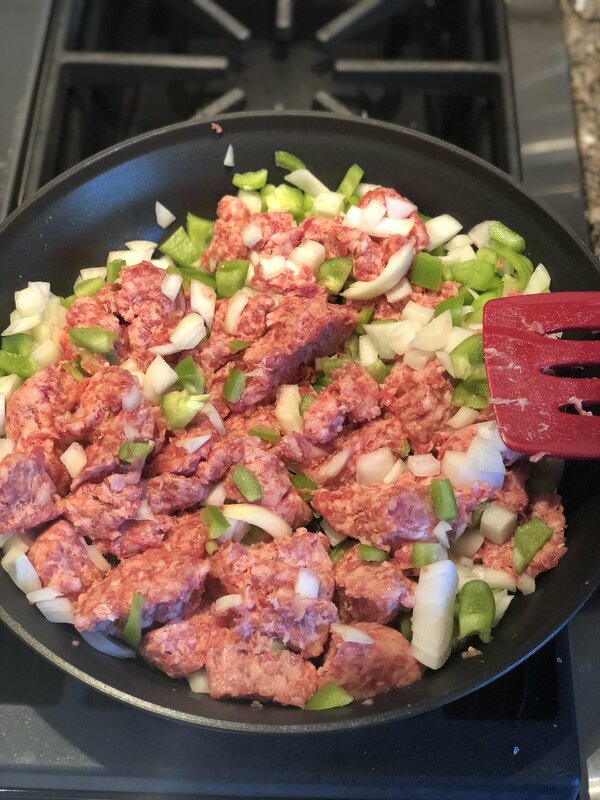 In a skillet, brown the ground beef until cooked, drain. Stir in mushrooms and spaghetti sauce. Set aside. If you like the mushrooms more cooked like I do, I let them cook with the beef until tender. 2.) Cook spaghetti or cauliflower, drain. Add the cream cheese, spices and garlic. Stir until cream cheese is melted. Make sure you really drain the cauliflower as it is more watery than spaghetti noodles. Mix sauce and meat mixture with the cauliflower. 3.) Lightly grease a 9X13 pan. Spread mixture in the pan, add cheese to the top. Cover with foil and bake for 45 minutes or until bubbly. I would have loved to serve this with garlic bread but that is not Keto friendly and I didn’t have any on hand. This dish was even better a few days later warmed up for lunch! As you know I do love cooking but I may love the “prep” time as much as I love the actual cooking! It is the time that I turn on some music, pour a glass of wine, and have a little me time. As a Mom, you have to take the me time wherever you can get it. Am I right?? 1/2 cup or less of salsa- I used corn & black bean mild salsa from HyVee because my toddler doesn’t like spicy. You can use more salsa too, but I was watching the sugar content. 3 bell peppers- I used orange, yellow, and green peppers- cut stem out and clean insides of them out. 4oz shredded Colby jack cheese (or any cheese) I add most of it to the mixture, then top the peppers off before baking. 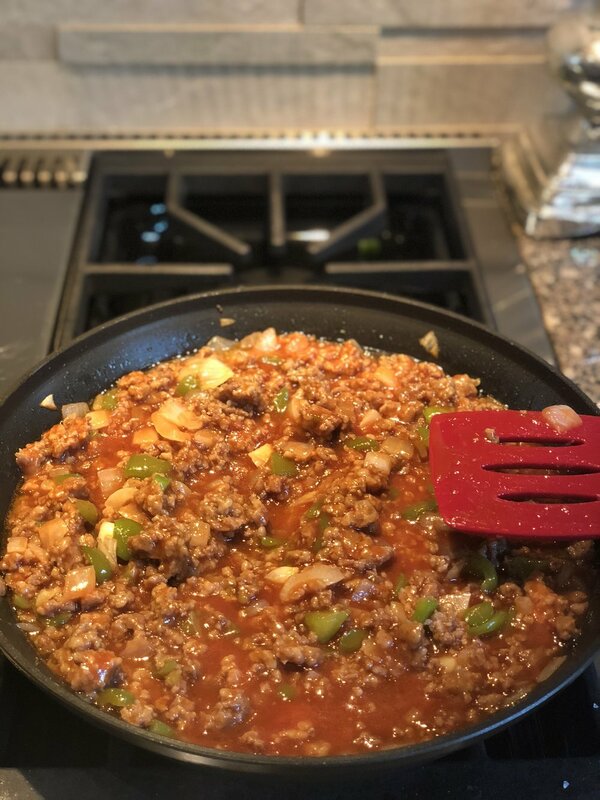 I am trying to still cook low carb so I did not add anything else, but I think you could add black beans, some veggie like corn or rice if you wanted to make more peppers. Preheat the oven to 350 and I put them in a glass dish, covered with foil for 40 minutes or until pepper is cooked! This recipe is courtesy of my sweet Mother in-law, Betty. My husband's family has been vacationing in Wisconsin for over 30 years at the same resort and each year they have a picnic. She makes this 5 bean salad/casserole and it is my husbands favorite. He actually loves a lot of what she cooks but she cooks like I do....add a little here, add a little there so when I actually get a written recipe, I am thrilled! This is a great side dish to take to a potluck, cookout, or make as a side with your family dinner! 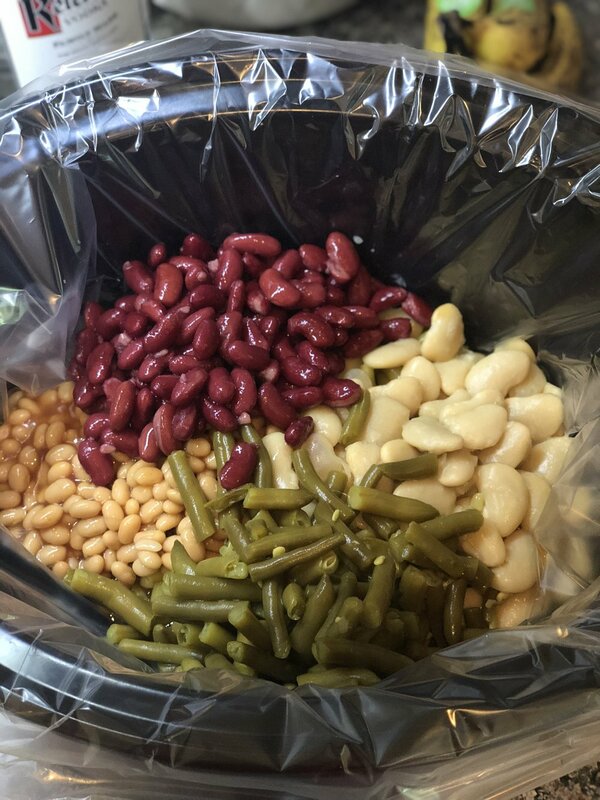 Very easy to make and you can either use the oven or a crockpot! Enjoy! 1.) Sauté sausage with onion and green pepper. Add brown sugar and tomato soup to pan, stir well. 2.) Add all cans of beans to the mixture, drain and rinse first. 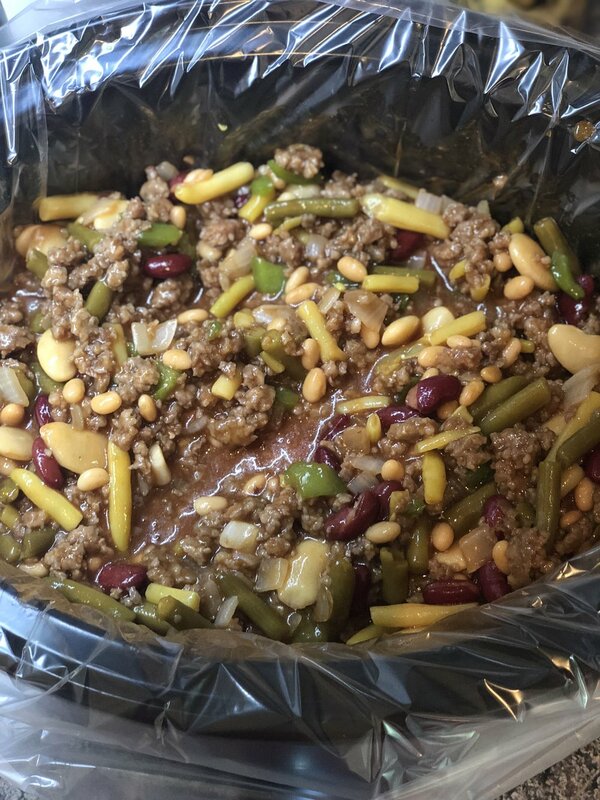 Then pour into 13X9 casserole dish and bake at 350 degrees until hot (apx 40 min) or put all ingredients into a slow cooker and cook for 3-5 hours.